Avoid overtraining by finding the optimal length of your exercise routine. Are the hours you spend at the gym seemingly endless? Do you have yet to see the results for how much time you put in? You’re not alone! At one point or another, we’ve all felt discouraged with the time we’ve invested in the gym. Whether you’re looking to lose weight or bulk up, the amount of time you spend at the gym affects your fitness progression to a large degree, for better or worse. Did you know there is such a thing as overtraining? Overtraining refers to excessive exercise that can hinder your performance and lead to injuries. 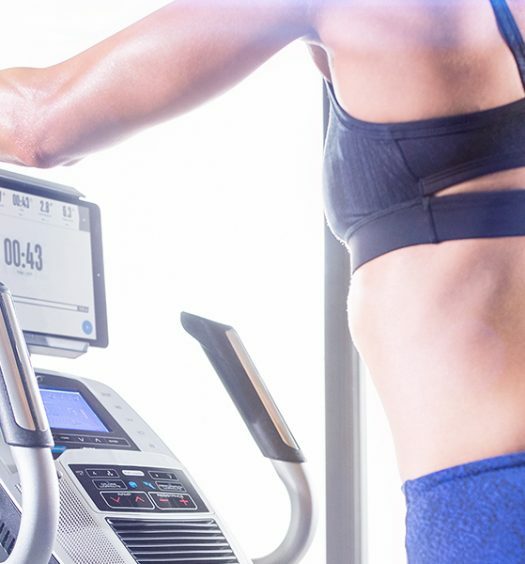 Excessive cardio burns off muscle instead of fat, leaving you “skinny fat”—a term associated with a high body fat percentage, despite having a lower weight. With overtraining, you’re likely to burn out physically, mentally, and emotionally…things we all want to avoid. Though common sense might tell you the longer you spend exercising, the healthier you’ll become, the optimal amount of time spent working out can vary greatly between individuals. Age, intensity of routine, and type of training are all major factors that contribute to how long and what type of fitness regimen you should follow. Keep the following information in mind when you head to the gym, and make the most of your time! 6-17 years old: 60 minutes of physical activity per day is recommended for children. This should include engaging in vigorous activity at least 3 of those days a week.1 Enrolling your children in extracurricular activities, walking them to school, playing a game of catch in the backyard, or letting the little ones get their daily dose of jumping on the trampoline are all great ways to meet these guidelines. 18-64 years old: Recommendations from the American College of Sports Medicine state that adults should receive 150 minutes of cardiovascular exercise per week. You can split up that time participating in moderate exercise five days a week for 30 minute sessions, or 20-60 minutes of vigorous exercise three days a week.2 A helpful tool in discovering your exercise intensity is to measure your Rate of Perceived Exertion (RPE). The RPE scale ranges from 0-10. Resistance training is recommended for all adults, two to three times a week.2 It’s vital to strengthening your body as it ages and your bones become brittle. Also, as you build muscle, you also burn fat, which helps fight the myth of the “inevitable” bulking up from weight lifting. It’s important, however, to wait 48 hours between resistance training sessions to reduce your chance of injury, muscle burnout, or overuse. If you’re interested in High Intensity Interval Training, or HIIT, your workout sessions should typically range from about 15 to 40 minutes. This type of exercise falls under the category of “vigorous exercise,” and uses intervals to keep your body surprised. HIIT training forces your body to expend its energy in intense bouts. It elevates your heart rate for a short time, then is immediately followed by small resting states, or less intense exercises that lower your heart rate. HIIT is an especially great form of training if you feel like you’ve hit a plateau, since it’s constantly demanding intense and unique work from your body. Keep in mind that healthy hearts need cardiovascular endurance exercise as well as high intensity interval training. To keep a good balance, maintain an elevated heart rate for three, 30-minute cardio sessions per week. Click here for more cardiovascular exercise tips. Avoid burning through time at the gym by staying organized. Create a workout plan beforehand so you have direction. If you suffer from over-populated facilities and find yourself waiting for machines, keep some good bodyweight exercises on hand to keep your heart rate up and make the most of your time. Organization is also important for spacing out your sessions so you can prevent injury. Don’t be discouraged if you’re unable to meet the current recommendations for weekly exercise—some exercise is better than no exercise! Even 10-minute sessions of exercise works wonders compared to sitting on the couch. And while it’s good to push yourself, gradual progression is the safest way to improve your physical fitness. So listen to your body and we’ll see you at the gym! I am 65 years retired man. I am not that fit to exercise nowadays and I am getting weight day by day. I really don’t like to be overweight men though I am 65 now. Is there anything recommended for me that can help me to lose some weight?? Gilbert, trying a simple low-impact exercise program could be greatly beneficial. I would recommend starting by just walking on incline. And trying to fill up on at least 5 fruits and vegetables each day can have great weight loss benefits. We have great recipes and workouts here on the blog! Question: has anyone had problems calling billing – today alone I called 4 times and was on hold 25-45minutes each time. chat doesn’t work and emailing only returns a reply to reset your password. I am trying to get a refund on my membership that was paid 1 year. I am asking for help as I am at a lost. it seems if you want to order product you can get through but to get through to Billing is like going into a Black Hole. Email a Ms. Logan over media, to no avail again. how do I get a refund and has anyone else experienced this WONDERFUL customer service? I’m 70 years old in 2005 I had two heart attacks and a mild stroke with in two months. In 2006 They put a pacemaker in me, in 2007 the replaced both of my knees a week apart, and last summer, when I was at the young age of 69, I rode my mountain bike over 1500 miles, and now, with the winters we have, I work more on the treadmill using ifit, which helps me keep from being bored since I can walk in so many places, and I have my bicycle on a trainer. My point is it took me 11 years to get from my heart attacks to where I am; follow your doctors advice, as they say take baby steps, and it is very possible you can improve it just won’t happen overnight. I get up at 4:30am. Crazy! No because I roll out of bed straight onto the floor with my iPhone and time a 2 minute plank. Then NHS back excercises before heading upstairs for a 25 minute spin ride at mod to vigorous rpe. I then go down stairs to the treadmill and run 2 miles at 7mph and slowly going up to gradient 5 All before I head off to the office. Why? Because life is great when you are tougher than the day ahead of you!! Strong work, Martin! Way to start the day off right!